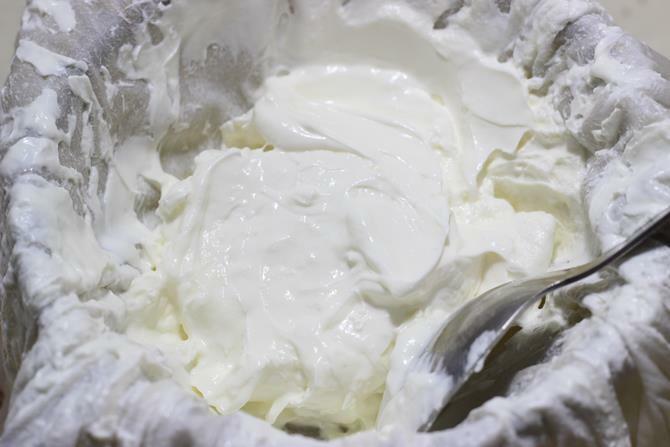 Hung curd recipe – Learn to make hung curd or hung yogurt with step by step photos. 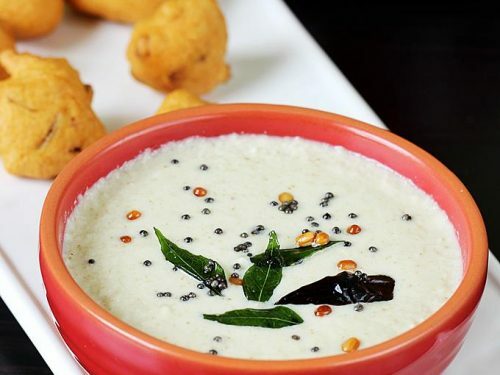 Hung curd or hung yogurt is made by draining the whey from curd to get a thicker consistency that is suitable to use in recipes like Dahi kabab, raita, wraps, sandwiches, shrikhand, dips and deserts. 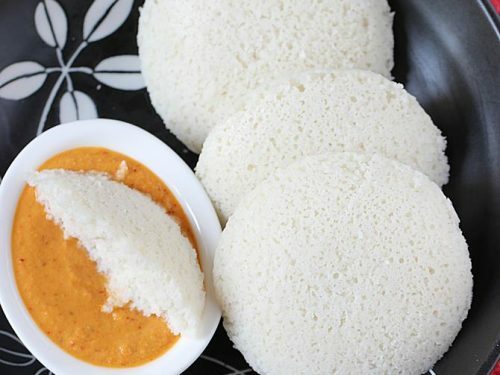 Hung curd is low in sugar, carbohydrates and high in protein when compared to the regular curd. 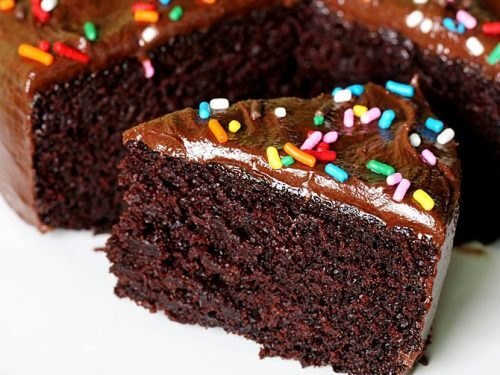 So it can be enjoyed even by those on a low carb diet. 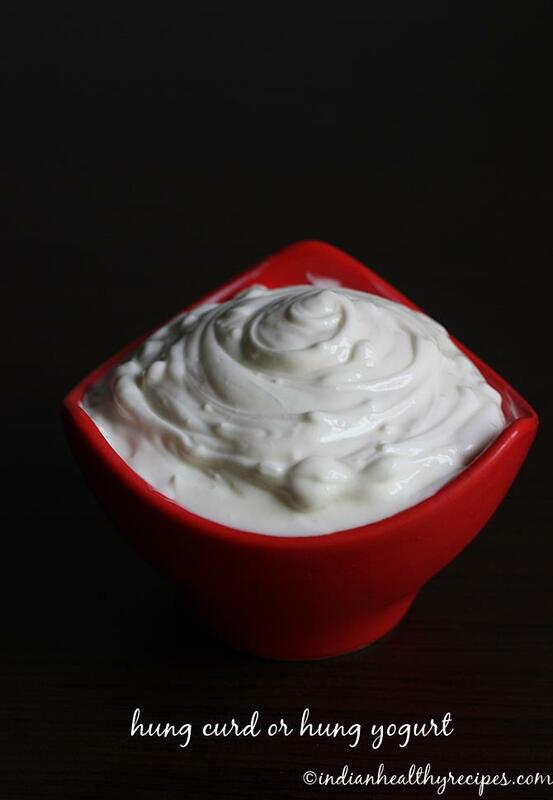 I made this hung yogurt to make restaurant style raita that is creamy, thick and delicious. 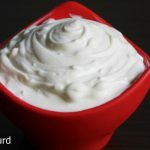 Here are the step by step pictures on how to make hung curd. I usually pour the yogurt to a muslin cloth and then drain it for about 30 minutes just above the kitchen sink. Later i hang it in the refrigerator using a steel hook and then place a tall cup beneath to collect the whey. Since most of us may not have hooks i thought of sharing this method which i saw in a YouTube video. 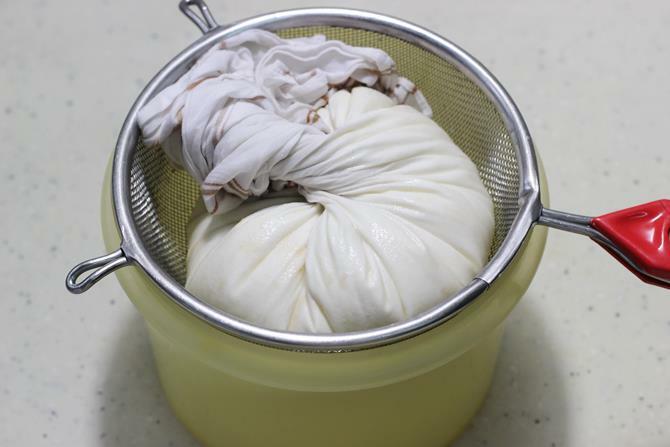 Hung curd is just plain yogurt from which whey has been strained out using a cheese or muslin cloth. 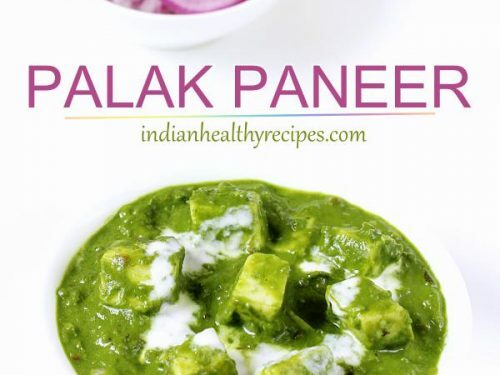 This can be eaten plain or used for making kababs, chutneys and dips. Place a colander or filter over a container to collect whey. Spread a muslin or cheese cloth over a colander or filter. Add yogurt to the cloth. Make a knot and hang it just above your kitchen sink, so that the whey drips to the sink. After 30 to 45 minutes, squeeze off excess whey from the cloth. Put the cloth on the colander and cover it. Keep it in the refrigerator about 4 to 8 hours. 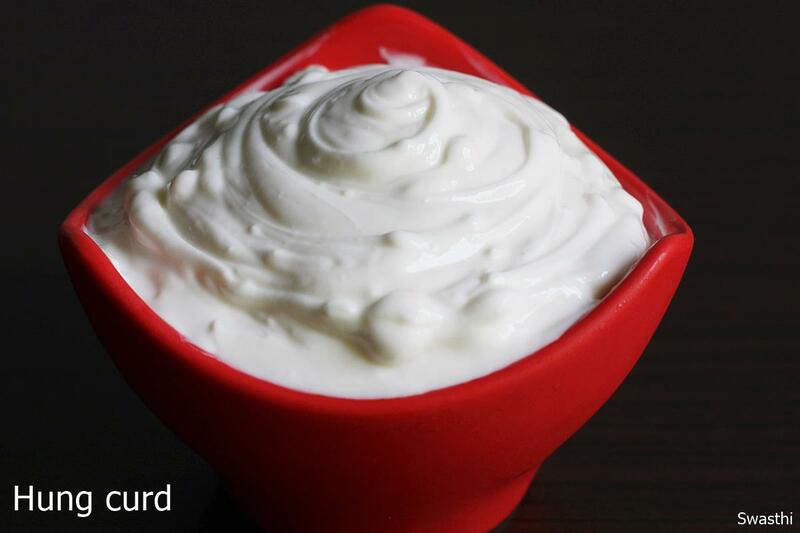 Use hung curd for making shrikhand, dips, tandoori marinade etc. 1. Place a filter or a colander over a container to collect whey. 2. 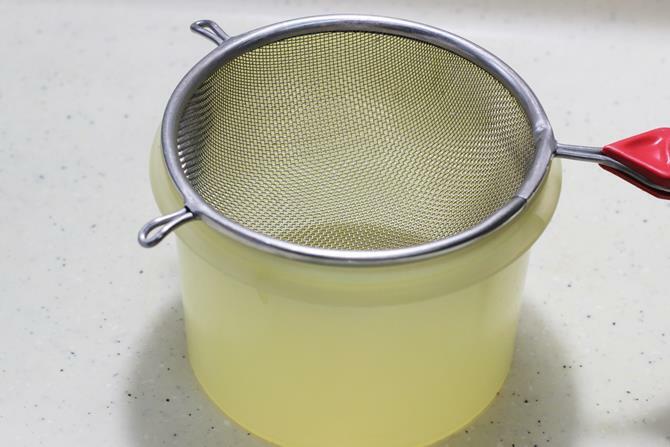 Place a muslin cloth over the filter and add yogurt to it. 3. Bring together all the four edges and squeeze of the excess water lightly. Make a knot and hang it above the kitchen sink, the dripping whey can be collected and used for kneading roti dough. Leave it for about 30 to 45 minutes. Place it back on the filter. 4. Cover it with a lid. 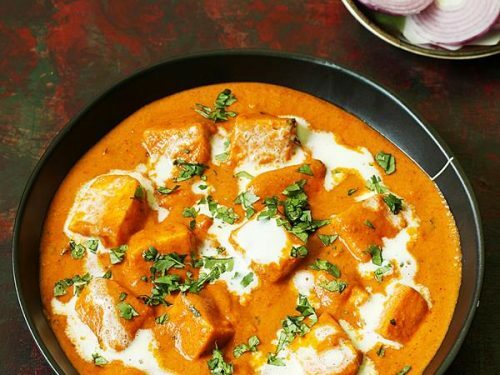 Place it in the refrigerator for 4 to 8 hours, depending on the fats and texture of yogurt used. 5. 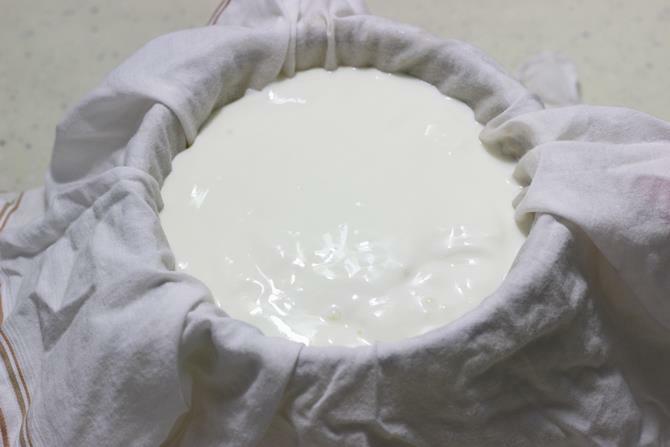 After 4 hours, hung curd is ready. 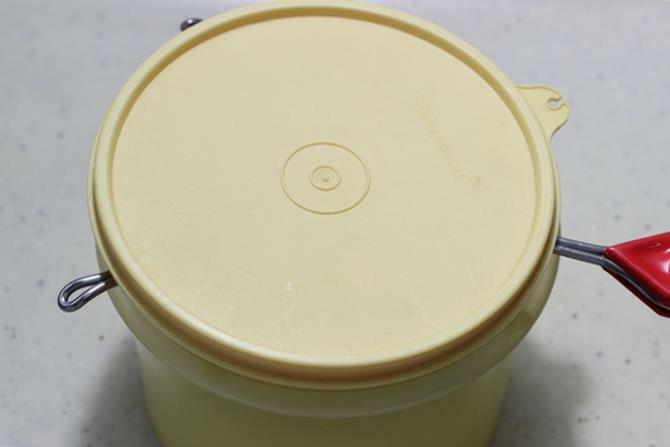 Refrigerate hung curd until use. 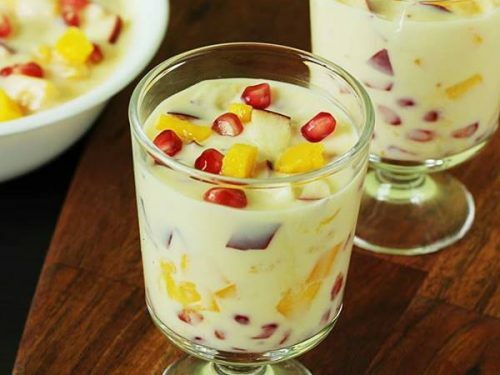 I can’t find the type of yogurt that is best used for this, any suggestions of types or brands?